With the hardware built, now it's time to put hardware and software together. Using the tutorials mentioned in the previous post, I put together some code to read the time from the real time clock, tell the alarms library what time it is and use the alarms library to create an alarm to turn on the LED strip. I also added a button to turn off the lights (you could just reset the board, but now I have a button that I could use for other things). Some notes on putting this together. 1. I think I accidentally destroyed digital pins 8 and 7 on the chip I'm using. They don't read anything in when I tried attaching a button to them. Oh well. I am now using pin 2 for a button. 2. 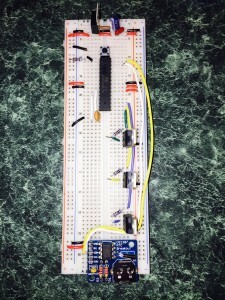 I had the 12V power supply powering the arduino while having the arduino board (with the Atmega328p removed) connected to the board. 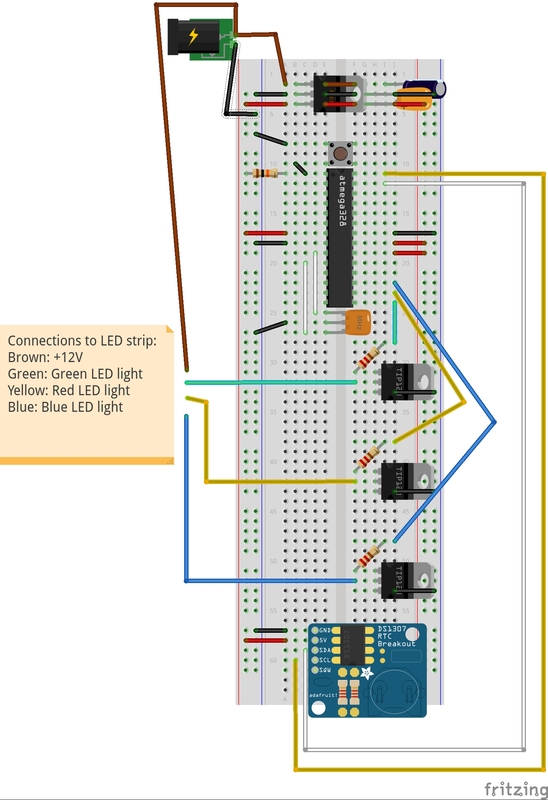 The 5V from the arduino board was not connected to the breadboard, so I shouldn't be running power from my external power supply back into my usb hub. however, the grounds are electrically connected. This is probably sending some weird electrical noise back into my computer. This made my laptop turn off mysteriously and say that it had an error. I may be frying my usb hub. 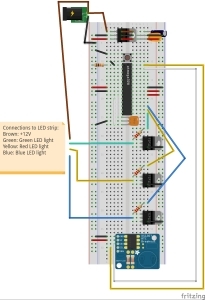 In the future, I should get some optocouplers to isolate my two circuits (my computer and the arduino) since I am using two power supplies (my computer's usb hub and the 12V power supply for the LED strip).